What Are Barcode Thermal Labels? Barcode thermal labels are used to track everything from products to patients. Healthcare services, veterinary practices, manufacturers and distribution companies are just a few of the many industries that utilize barcode thermal labels. Barcode thermal labels can be applied to a wide variety of applications including shipping labels, asset labels, inventory labels, patient wristbands and identification and more. 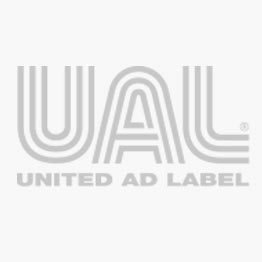 United Ad Label barcode thermal labels come in various formats that fit numerous software systems. The labels are glove safe and smudge proof. Plus, UL/cUL and CSA approved products are available. Direct Print Thermal Label, 3" Core, 2" x 4"
Direct Printer Thermal Label, 1" Core, 2" x 2"
Direct Printer Thermal Label, 3" Core, 2-1/2" x 1"
Direct Thermal Printer Label, 3" Core, Rem, 3" x 1"
Direct Thermal Printer Label, 3" Core, Rem, 3-1/2" x 1"
Direct Thermal Printer Label, 3" Core, Rem, 4" x 1"
Direct Thermal Printer Label, 3" Core, Rem, 4" x 2"
Direct Thermal Printer Label, 1" Core, 1" x 1/2"